For the Central American city, see Paso Canoas. 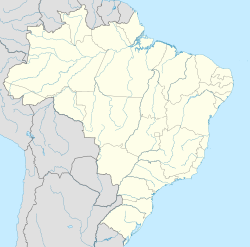 Canoas (Portuguese pronunciation: [kaˈnoɐs]), which earned city status in 1939, is a municipality in the Brazilian state of Rio Grande do Sul. With more than 300,000 inhabitants, it is part of the Porto Alegre conurbation and has the second highest GDP in the state. It is also the fourth largest city in the state by population. Canoas boasts a strong manufacturing-based economy and is the home of the Canoas Air Force Base, used by the Brazilian Air Force. After obtaining city status, Canoas experienced rapid growth, especially after 1945. At that time, it would be called a "cidade-dormitório" (Portuguese for "bedroom city"), because thousands of people would commute to neighboring Porto Alegre to work. However, de-industrialisation in Porto Alegre, the setting-up of numerous manufacturing plants in Canoas and a strong demographic growth have reverted that situation and nowadays Canoas has a per capita GDP higher than Porto Alegre. Canoas ("Canoes" in English) consists of mostly large sprawling neighborhoods and a lively business district, as well as numerous large factories, among them the Refinaria Alberto Pasqualini (REFAP), a Petrobras oil refinery. The city's neighbourhoods follow a common pattern in Brazil, combining new high-end districts showing rapid urban development with working-class areas which turn into slums as one moves away from the city centre. The city's poorest neighbourhoods were originally unplanned. The Guajuviras subdivision, the old Guajuviras Farm that was developed by the government, was originally settled by squatters before the government officially opened the property for inhabitation. Although traditionally crime-ridden, Guajuviras has experienced lower criminality levels as of lately due to government intervention and the better living conditions experienced by Brazilians in general. Canoas has one of the richest and most important universities in southern Brazil: the Ulbra (Lutheran University of Brazil), as well as catholic La Salle University(UnilaSalle) and Centro Universitário Ritter dos Reis. In sports, volleyball team Canoas Vôlei plays in the Brazilian Superliga de Vôlei, whereas football team Canoas Futebol Clube plays in the Campeonato Gaúcho. Wikimedia Commons has media related to Canoas. This page was last edited on 28 January 2019, at 18:51 (UTC).